While I am not a fan of some of the berry beers (I believe that Leinenkugal’s Berry Weisse needs to be “cut” with a Budweiser or other light beer to be drinkable!) – I do enjoy a well done Lambic (Belgian sour ale). While traditional Lambic brews are low in alcohol content (around 4-5% ABV) and usually feature red fruit (raspberry/framboise, cherry/kriek, strawberry/fraise) and are brewed in Belgium, it is enjoyable to stumble upon a special Lambic on occasion. Such was the case with a local Tampa Bay area brewpub called Lagerhaus in Palm Harbor, FL which featured a wonderful in-house Maracuja (Passionfruit) Lambic topping out at a whopping 14% ABV. I had heard that brewmaster Franz Rothschadl knew his stuff – and after tasting this Lambic, I couldn’t agree more. It was subtle yet bold in passionfruit flavor (my favorite of all fruits) and packed a complexity not commonly found in the lighter lambic brews. The Lagerhaus beer menu on the week I was there (the first week in January 2012) featured several other lambics (the brews change with the batches) and a medieval brown sour ale among others. 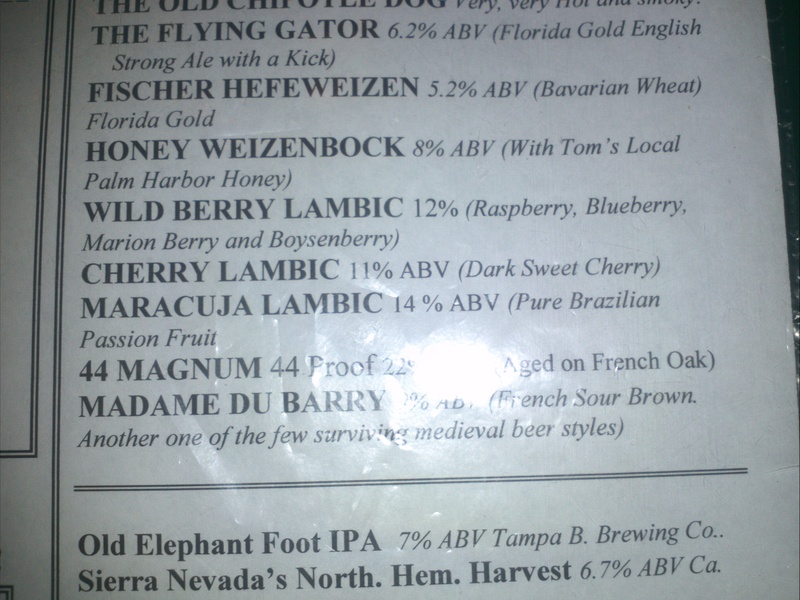 Lagerhaus is a brewery and grill definitely worth a visit if you are in the Tampa Bay area! I joined friends from the Tampa Bay BeerMug meetup group last evening at a Belgian Beer education night at Total Wine in St. Petersburg (Park Street Retail Center, 4880 Park Street North, St. Petersburg, FL 33709). Chris was our local Beer Expert from Total Wine who led us through a PowerPoint presentation about the various Belgian beer styles, as we sampled a variety of Craft Brews both imported or domestic – all specifically Belgian in style. Chris was both knowledgeable and approachable as he led an interactive discussion about our observations as we sampled each brew. This was my first encounter with the Total Wine’s Beer education nights (the St. Petersburg store seems to feature more classes than other stores!) – and I’ll be back. It was definitely a worthwhile investment – we had a small group (about 15 people of the maximum 30 class size) and Total Wine provided the beers and a selection of cheeses, breads/crackers, and savory meatballs. These proved to be a good way to begin pairing food and tastes with various beer styles. I’ve included the St. Petersburg Total Wine education classes calendar excerpt and a link and phone number where you can register for classes at the end of this post. If you live elsewhere, simply visit www.totalwine.com and you can see what beer classes are offered in your area. 7venth Sun Midnight Moonlight Berliner Weisse (US, ABV 5%) – growler. 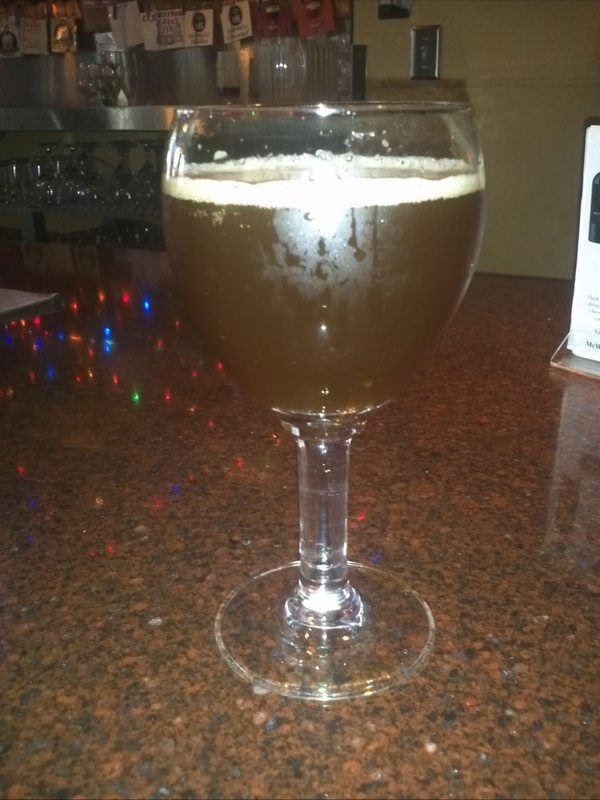 Note: this was not a Belgian style brew but we had the opportunity to sample this Tampa Bay local offering as a bonus! Thurs. Mar 22, 2012 (6:30-8:30PM) – Introduction to Beer: Get Your Suds On! Sat. Mar 24, 2012 (3-5PM) – Introduction to Beer: Get Your Suds On! To register for these upcoming Beer Classes, reserve your place by calling Total Wine St Petersburg, FL at 727-544-6018. Each session is $15. payable the day/evening of class.